Climate in Goa. At 15°N Goa lies well within the Tropics. Throughout the year therefore it is warm, but its position on the coast means that it never suffers the unbearable heat of India's northern plains. However, from mid-April until the beginning of the monsoon in mid-June both the temperature and the humidity rise sharply, making the middle of the day steamy hot and the sand of the beaches almost untouchable. But it is the monsoon itself which defines Goa's climate and its seasons, standing like a dividing wall between the heat of early summer and the beautiful warm clear and dry weather of its tropical winter, stretching from October to March. Many myths surround the onset of the monsoon, derived from an Arabic word 'maunsam' which means simply 'season'. In fact its arrival is as variable as is the amount of rain which it brings. What makes the Indian monsoon quite exceptional is not its regularity but the depth of moist air which passes over the sub-continent. Over India, for example, the highly unstable moist airflow is over 6,000m thick compared with only 2,000m over Japan, giving rise to the bursts of torrential rain which mark out the wet season. Goa's location halfway up India's west coast places it directly in line as the moisture laden winds sweep up from the southwest across the Arabian Sea. Forced to climb rapidly as it hits the Western Ghats the cooling air mass immediately releases its water, making June and July in Goa wet months. In an average year Panaji for example receives around 1,500 mm in just 6 weeks. On the coast itself this rain often comes as torrential storms accompanied by lashing winds, while up in the cooler air of the Ghats if it is not raining you can usually rely on the hill tops being in swirling cloud and mist. It's a good time of year for the waterfalls! While heavy showers persist into August and September and the high humidity can continue to make life unpleasant the rainfall drops sharply away and in October most of the state receives less than 100 mm. Life returns to normal as the cooler dry air of the North East monsoon pushes southwards from the Tibetan plateau, bringing beautifully invigorating dry clear air to the rainwashed skies. It is the perfect season for visiting Goa, cool enough at night sometimes to need a pullover, but still hot in the open sun on the beach. 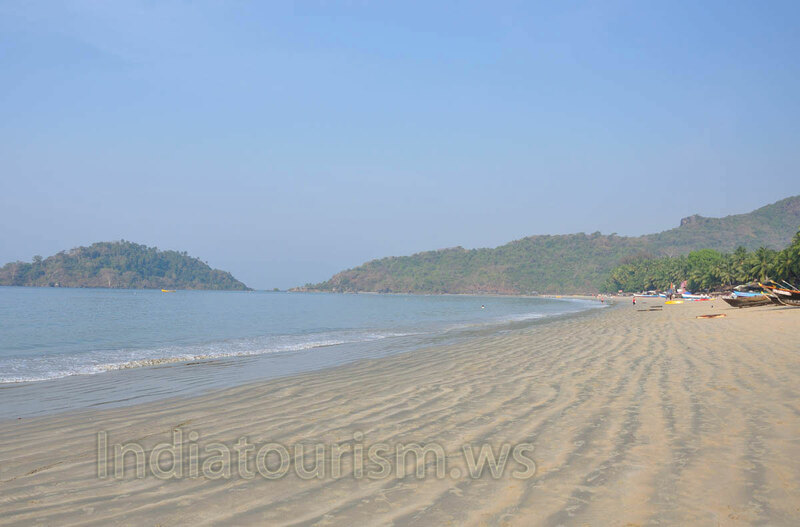 While the climate of Goa itself is dominated by its position to the west of the Ghats, the land immediately across the ridge of the hills experiences quite a different climate. Almost straight away on crossing the Ghats you notice the effects of far lower total rainfall. Although the entire region of neighbouring Karnataka and Maharashtra experiences exactly the same seasonal pattern of change in the wind system which brings Goa its wet monsoon, once the winds have climbed the Ghats and start their descent over the plains they dry out rapidly.